The beauty of randomness: Captchas. While I find captchas as annoying as, well, everyone else does, I also enjoy the beauty of their randomness. Our company Digital Anarchy builds some of its products around that idea, like our Texture Anarchy pattern generator for Photoshop textures. Texture Anarchy harnesses fractal noise, algorithms and other techy chaos into really pretty textures. A few days ago, I posted an ad in the Talent section of Craigslist. 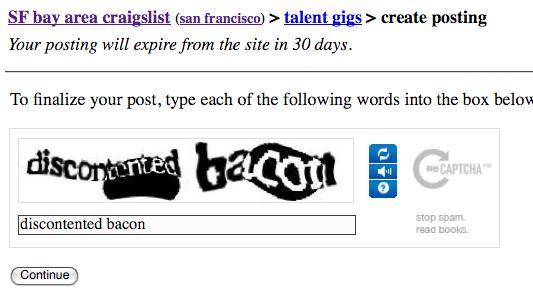 The captcha that I had to fill out, ‘discontented bacon’, was geekiness to its max. More on what this talent ad was for in a few days… we’re excited.